When decorating for the holidays, it’s all about the lights. We all have lights on our trees, lights in our windows, lights in our yards. What what about the lights in our home. I like to add something extra special to those as well. It’s easier than it sounds! To achieve this gorgeous look was so simple. 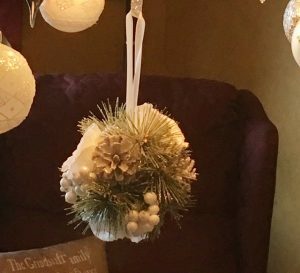 All you need is some ribbon, some beautiful ornaments, and a floral ball. I used white curling ribbon to attach the decorations. For the centerpiece I used a floral ball I purchased at Michaels. 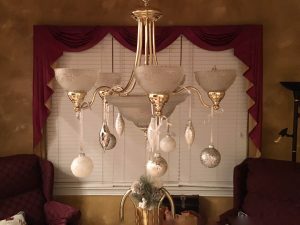 I used this set of white and silver ornaments from Michaels, but a similar set can be found here. 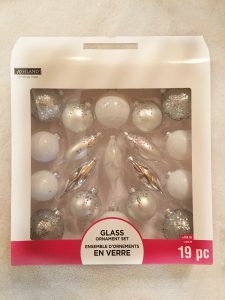 I recommend using glass ornaments because of the added sparkle and heat resistance – though I wouldn’t hang them from any portion of the light fixture that significantly heats up while in use. I used various shapes and hung the ornaments at different lengths. I hope you love the results. 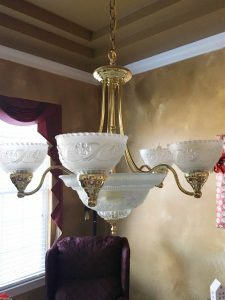 It certainly add sparkle to the dining room and would be beautiful with any color combination. 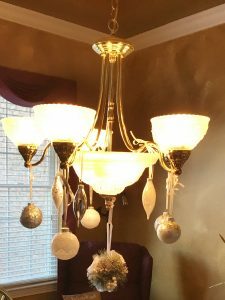 Here’s a photo of my chandelier when it isn’t decorated extra-special.